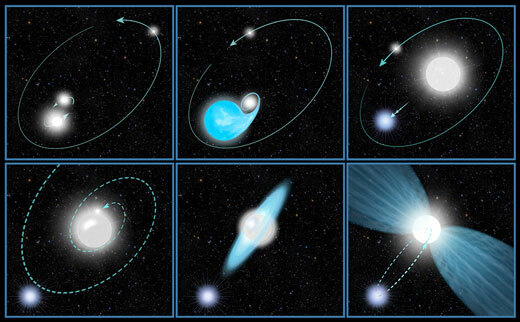 (Nanowerk News) What happens when a star behaves like it exploded, but it's still there? An explanation for the eruption has eluded astrophysicists. They can't take a time machine back to the mid-1800s to observe the outburst with modern technology. However, astronomers can use nature's own "time machine," courtesy of the fact that light travels at a finite speed through space. Rather than heading straight toward Earth, some of the light from the outburst rebounded or "echoed" off of interstellar dust, and is just now arriving at Earth. This effect is called a light echo. The light is behaving like a postcard that got lost in the mail and is only arriving 170 years later. The light echoes were detected in visible-light images obtained since 2003 with moderate-sized telescopes at the Cerro Tololo Inter-American Observatory in Chile. Using larger telescopes at the Magellan Observatory and the Gemini South Observatory, both also located in Chile, the team then used spectroscopy to dissect the light, allowing them to measure the ejecta’s expansion speeds. They clocked material zipping along at more than 20 million miles per hour (fast enough to travel from Earth to Pluto in a few days). "We see these really high velocities in a star that seems to have had a powerful explosion, but somehow the star survived," Smith explained. "The easiest way to do this is with a shock wave that exits the star and accelerates material to very high speeds." Massive stars normally meet their final demise in shock-driven events when their cores collapse to make a neutron star or black hole. Astronomers see this phenomenon in supernova explosions where the star is obliterated. So how do you have a star explode with a shock-driven event, but it isn't enough to completely blow itself apart? Some violent event must have dumped just the right amount of energy onto the star, causing it to eject its outer layers. But the energy wasn't enough to completely annihilate the star. If that's the case, then the present-day remnant binary system must have started out as a triple system. "The reason why we suggest that members of a crazy triple system interact with each other is because this is the best explanation for how the present-day companion quickly lost its outer layers before its more massive sibling," Smith said. In the team's proposed scenario, two hefty stars are orbiting closely and a third companion is orbiting farther away. When the most massive of the close binary stars nears the end of its life, it begins to expand and dumps most of its material onto its slightly smaller sibling. Hot helium core stars are known to represent an advanced stage of evolution in the lives of massive stars. "From stellar evolution, there's a pretty firm understanding that more massive stars live their lives more quickly and less massive stars have longer lifetimes," Rest explained. "So the hot companion star seems to be further along in its evolution, even though it is now a much less massive star than the one it is orbiting. That doesn't make sense without a transfer of mass." In the merger's initial stages, the ejecta is dense and expanding relatively slowly as the two stars spiral closer and closer. Later, an explosive event occurs when the two inner stars finally join together, blasting off material moving 100 times faster. This material eventually catches up with the slow ejecta and rams into it like a snowplow, heating the material and making it glow. This glowing material is the light source of the main historical eruption seen by astronomers a century and a half ago. Meanwhile, the smaller helium-core star settles into an elliptical orbit, passing through the giant star's outer layers every 5.5 years. This interaction generates X-ray emitting shock waves. A better understanding of the physics of Eta Carinae's eruption may help to shed light on the complicated interactions of binary and multiple stars, which are critical for understanding the evolution and death of massive stars.